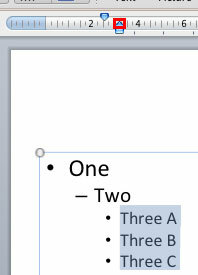 Learn how to tweak the starting point of paragraphs in bulleted lists using the Hanging Indent Marker in PowerPoint 2011 for Mac. The First Line Indent Marker influences the position of bullet characters (or numbers in a numbered list). The Hanging Indent Marker tweaks the positioning of the paragraph following the bullet character -- we explore this Marker within this tutorial. The Left Indent Marker links both the First Line Indent Marker and Hanging Indent Marker. Note: For reasons of clarity, we will use the term "bullet" for the rest of this tutorial -- but anything we do with a bullet in a bulleted list works the same way for a number in a numbered list. Among the three Indent Markers you see on the Ruler, the Hanging Indent Marker, highlighted in red within Figure 1 is used to tweak the position of the paragraph following the bullet character. Select the bulleted paragraphs for which you want to alter the spacing-after-the-bullet. In Figure 1 above you can see 3rd level bulleted paragraphs selected. For this example, we are selecting 3rd level bullets so that you can explore the effect of moving Hanging Indent Marker for the selected paragraphs towards both the sides (leftwards and rightwards) -- if we had selected a first level paragraph, we could have only moved it rightwards. If you want to move the selected paragraphs rightwards (farther away from the bullet), click on the Hanging Indent Marker and drag it rightwards along the Horizontal Ruler as shown in Figure 2. It is quite possible that by mistake you select the Left Indent Marker that sits below the Ruler rather than selecting the Hanging Indent Marker, which sits on the Ruler -- make sure you click and drag the latter. Tip: Pressing the Command key while you drag the indent markers will give you more control over the placement. Stop dragging when you are in the new position where you want to place the selected paragraphs. In Figure 3 you can see that the selected paragraphs is moved rightwards. Compare Figures 3 and 2 to see the increased space between the round bullet characters and the paragraphs. We next dragged the Hanging Indent Marker leftwards so that it is placed right below the First Indent Marker (see Figure 4). You can continue dragging the Hanging Indent Marker leftwards beyond the position of the First Line Indent Marker, as shown in Figure 5. This actually causes the bullet character (or number) to move leftwards, rather than the paragraphs. Notice the position of the selected paragraphs in Figure 6, below – even after moving the Hanging Indent Marker leftwards beyond the First Line Indent Marker, the actual position of the paragraphs has not changed (compare Figures 5 and 6). Note: Instead of changing position of bullet paragraphs on each and every slide in the presentation, you can access the Slide Master view and make changes. This way you will be making changes just once and every slide will be effected.